Al-Malki emphasized the depth of the historical relations between the two states and the shared history of liberation. He emphasized that the Palestinian leadership is careful to be together with the Korean people on this important occasion (i.e., the 70th anniversary of the establishment of North Korea). Al-Malki gave a letter from [PA] President [Mahmoud Abbas] to his North Korean colleague Marshal Kim Jong-un... Al-Malki said: 'His Honor the President’s letter is a message of solidarity with the North Korean people in similar circumstances, in which international pressure is being applied to our two peoples by the US.'" Headline: "The [PA] president opposes the Canadian interference in the internal affairs of the kingdom of Saudi Arabia"
"[PA] President of the State of Palestine Mahmoud Abbas emphasized that the Palestinian people and its leadership stand alongside the brothers in the kingdom of Saudi Arabia under the leadership of King Salman bin Abdulaziz and heir to the throne Prince Muhammad bin Salman. His Honor [Abbas] expressed his opposition to and condemnation of the interference in the internal affairs of the kingdom by any party. He said that it is a blow to the sovereignty of the kingdom over its land and its people... and described it as blatant interference. His Honor called on the Arab states to stand alongside the kingdom, and to oppose the Canadian interference in its internal affairs and to condemn it (referring to Canadian call to release detained rights activists; see note below -Ed.)." On July 31, 2018, the office of the UN High Commissioner for Human Rights (UNHCHR) said that at least 15 human rights and women's rights activists had been arrested or detained in Saudi Arabia since May 15, 2018. On August 3, 2018, the Canadian Foreign Ministry called for their immediate release. Headline: "He met with his Sudanese counterpart and with the FIFA secretary-general at the place where he was staying in Moscow – the [PA] president attended the World Cup final match, alongside many state leaders"
Headline: "The [PA] president congratulates the leader of North Korea for Liberation Day"
"President of the State of Palestine Mahmoud Abbas today, Tuesday congratulated First Secretary of the Workers' Party of Korea, Leader of the Democratic People's Republic of Korea National Leadership Committee, and Supreme Leader of the Army Kim Jong-un for [Korea's] Liberation Day. The president said in a greeting telegram for the occasion that the Korean people sacrificed the most precious sacrifices for its freedom and honor, and expressed appreciation for the solidary and stable positions of Korea supporting the rights of our people and its just struggle to end the occupation and establish our independent state and its capital of East Jerusalem - the surest guarantee of realizing a just peace that all peoples of the region seek. His Honor the president wished Leader Jong-un all health and happiness; the Korean people continued stability and prosperity; and that the historical friendly relations between Palestine and North Korea and their two peoples will continue to develop and grow." “[PA] President Mahmoud Abbas blessed Zimbabwean President [Robert Mugabe] on the occasion of his country’s Independence Day celebrations. Zimbabwe’s socialist authoritarian President Robert Mugabe has been in power since 1980 and has been condemned by Western countries for his long history of human rights violations including the massacre of 20,000 members of the Ndebele ethnic group in Matabeleland from 1982-1987, confiscating farms owned by white Zimbabweans and turning a blind eye to violence against them, overseeing a crackdown on political opponents and the media, corruption, and tampering with elections. Headline: "The [PA] president's envoy participated in marking the fourth anniversary of the death of Chavez"
Ismail, in the speech of the State of Palestine, the guest of honor, expressed the thanks and appreciation of the Palestinian people and its leadership for Venezuela's historical support of the Palestinian cause and for its courageous and noble positions to raise the voice of the just Palestinian cause in all of the international circles. This is the basic and ethical policy in which the late Chavez believed, and which was expressed by the support for the causes and struggle of oppressed peoples throughout the world, and primarily the Palestinian cause. He added that the people of Venezuela bears the flag and idea of Chavez and continues in his path, and that the global imperialism did not prevent Venezuela from defending the Palestinian cause and the causes of the oppressed peoples for their dignity and self-determination." 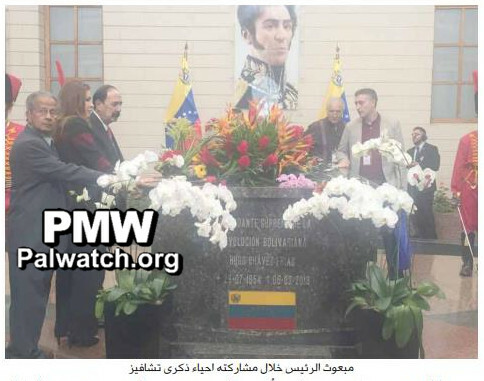 The article includes a picture showing PA President Mahmoud Abbas' envoy PLO Executive Committee member Mahmoud Ismail participating in the ceremony to mark the fourth anniversary of former Venezuelan President Hugo Chavez’s death at his tomb. Caption under picture: "The [PA] president's envoy during his participation in marking the anniversary of Chavez[‘s death]"
“Chairman of the Palestinian National Council (i.e., the legislative body of the PLO) Salim Al-Za'anoun yesterday [Feb. 22, 2017] briefed Iranian President Hassan Rouhani on the developments in Palestine. The meeting, which was held in Tehran, dealt with the Israeli violations throughout the Palestinian territories, and particularly against the occupied city of Jerusalem and its holy sites. Al-Za’anoun explained the importance of the Arab, Islamic, and international activity in order to aid our people and force the occupation to stop its crimes. Headline: "The [PA] president sent a telegram of condolences over the death of Rafsanjani"
"[PA] President Mahmoud Abbas yesterday [Jan. 9, 2017] sent Iranian President Hassan Rouhani a telegram of condolences over the death [on Jan. 8, 2017,] of former President of Iran and head of the Iranian council to protect the interests of the regime (i.e., the Expediency Discernment Council) Ayatollah Ali Akbar Hashemi Rafsanjani,. The president said: Rafsanjani died after 'a life full of activity dedicated to the loftiness of his homeland, the honor of his people, and defense of his nation's causes, and primarily the Palestinian cause.' The president conveyed on his own behalf and on behalf of Palestine his sincere condolences to Rouhani, his government, his people, and the family of the deceased, and asked that Allah let him dwell in Paradise." Abbas rep attends Fidel Castro's funeral, expresses "great admiration [for] the brave and noble positions that the late leader took"
“[PA] President Mahmoud Abbas sent PLO Executive Committee member and Deputy Secretary-General of [the Palestinian Democratic Union party] FIDA Saleh Rafat to take part in the funeral ceremony of the leader and international fighter, leader of Cuba Fidel Castro, today (Tuesday) [Nov. 29, 2016] in Havana, the capital of Cuba. Rafat said that the death of Castro is a loss not only for our friends the Cuban people, but also for the Palestinian people and for all of the free peoples and people of honor in the entire world. He noted that our people will always remember with great respect and great admiration the brave and noble positions that the late leader took in favor of the struggle [of the Palestinian people] for freedom, independence, and return. Abbas sends condolences on Fidel Castro's death: He fought for "the causes of right and justice in the world"
Abbas described the Cuban people as ‘friends’ of the Palestinian people. Cuba was the only Latin American country that voted against the United Nations partition of Palestine resolution in 1947. It was a strong supporter of the Palestinian struggle for independence from Israel and for its revolution. 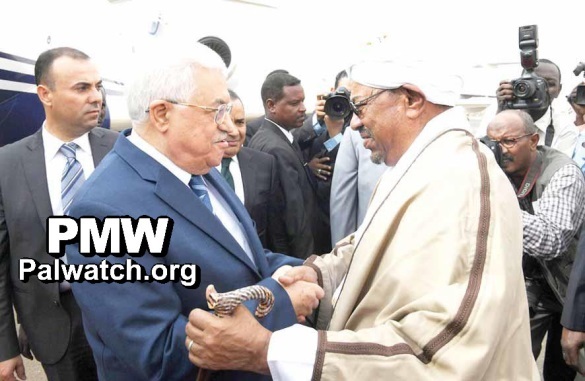 Excerpt from PA Chairman Mahmoud Abbas’ speech at a joint press conference with Sudanese President Omar Al-Bashir in Khartoum, Sudan. Abbas expresses "absolute solidarity" with Sudan and President Omar Al-Bashir in the face of "unjust economic sanctions"